Some of the most troublesome aspects of PCOS are due to the effect of excessively high levels of androgens. Androgens are male hormones, including especially testosterone. The effects of androgen excess include acne, unwanted hair growth, scalp hair thinning, and ovulation dysfunction and infertility. Androgens exert their effect by binding to molecules in the cell called "androgen receptors". It's like a lock and a key. The lock is the receptor and the key is the hormone. You need both the lock and the key to open the door. So if either the lock or the key is missing, nothing happens and the cell is not affected. If you look at the diagram below, you can see testosterone entering a cell at the bottom left. 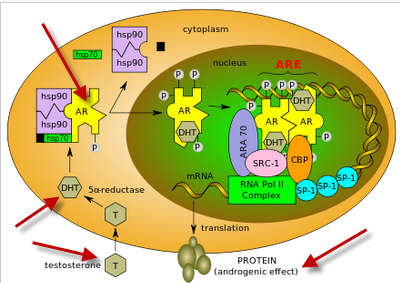 The little yellow things are androgen receptors, which receive the testosterone signal and cause the cell to go through a complex set of activities to produce the outcome ("androgenic effect") at the bottom right. Most of the time, we concern ourselves with reducing the level of androgens (bottom left in above diagram). But we also might get positive results by reducing the number of androgen receptors, causing them to be less active, or helping them behave in a more optimal way. This idea has been confirmed in animal studies, according to the University of Sydney in Australia. They said: "Animal models have provided strong evidence to support that androgen receptor-mediated actions are key mediators in the development of PCOS traits." In other words, androgen receptors appear play an important role in the creation of your symptoms. In addition, it is thought that androgen receptors in PCOS women have abnormal structure and function that is not found in women who don't have PCOS. Some suspect this abnormality is an additional cause of excessive androgens. The above is a gross oversimplification of a very complex and not fully understood process. OK then, are there any "natural" ways to suppress or better manage androgen receptors, and thus reduce the unwanted effects of testosterone? Big topic, but here are a few ideas. 1. There are a number of plant extracts that may help to reduce the effect of androgen receptors. A few of them are pomegranate, grape seed, green tea, DIM (diindolylmethane), berberine, and sulforaphane. You don't have to take "all" of these extracts, even though they may have a synergistic effect. Do your own research or consult with a health professional. You can get some benefit from eating pomegranates and dark or red grapes, drinking green tea, and consuming plentiful amounts of cruciferous vegetables (like broccoli, Brussels sprouts, cauliflower, collard greens, bok choy, kale, cabbage, chard, turnip greens, arugula, mustard greens, rapini, wasabi, watercress, radish, turnip, and rutabaga). 2. Other helpful nutrients are melatonin, fish oil, spirulina, quercetin, and curcumin (extract from turmeric). 3. Shed some fat weight if you can. 4. Adopt an anti-inflammatory diet -- high in whole plant foods, low in animal products and processed foods. 5. Adopt a diet high in omega-3 fats (mostly EPA/DHA from fish) and lower in omega-6 fats (such as vegetable oils and processed foods). Note that you need some androgens and androgen receptors for normal function. All we're trying to do is get androgen receptors and androgens to function at an optimal level, not too high and not too low. A better diet is always the first place to start. Plant extracts and supplements can be added in as needed. Walters KA et al. Androgens in polycystic ovary syndrome: lessons from experimental models. Curr Opin Endocrinol Diabetes Obes. 2016 Jun;23(3):257-63. Walters KA et al. Role of androgens in normal and pathological ovarian function.Reproduction. 2015 Apr;149(4):R193-218. Wang F et al. Alternative splicing of the androgen receptor in polycystic ovary syndrome. Proc Natl Acad Sci U S A. 2015 Apr 14;112(15):4743-8. McCarty MF et al. Beyond androgen deprivation: ancillary integrative strategies for targeting the androgen receptor addiction of prostate cancer. Integr Cancer Ther. 2014 Sep;13(5):386-95.